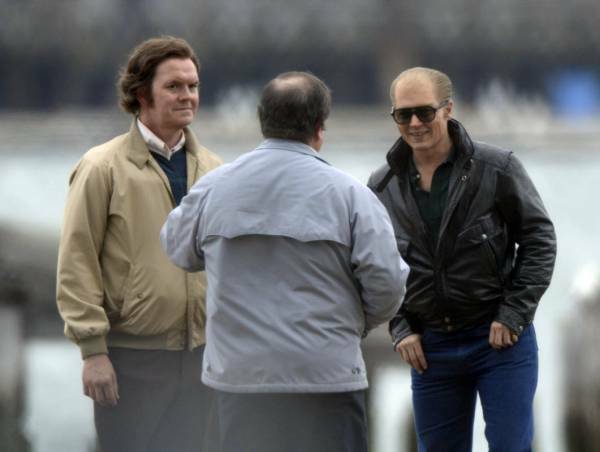 Without any surprise for me, there’s only one scene in Black Mass that doesn’t contain the use of that old stand by … the F-Word. It’s when, at the dinner table with his young son, notorious criminal Whitey Bulger is teaching his boy a life lesson: it’s not if you smack somebody in the face on the playground or not, but where and when. What you have to make sure of is “there ain’t no witnesses” … and all of it in a convincing Bostonian accent. Boston mob movies are near the top of my “favorites” genre list. 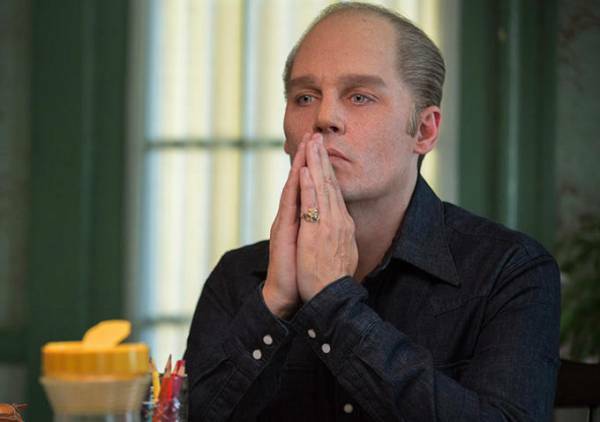 There are many, and Black Mass is one of the good ones. It’s pretty much a true one too. Read yourself up on James “Whitey” Bulger if you haven’t. What he’s done, in turn, reads much like a movie script or a novel by Dennis Lehane. The extra flexible Johnny Depp has removed his pirate’s chapeau and war paint to let folks in makeup sort of overdo it to convince us Depp looks menacing, big time. That’s what you do if the thug you’re chronicling is working hard to make the Irish mob big time … in competition with the Cosa Nostra and all those pesky G-Men who sometimes get swallowed up in the terrific swirl of the crime they’re paid to stop. With blurred boundaries and in deeper denial than an anti-climate-change politician, the Bulger saga unfolds for the strong of heart. Blood? Oh yes. Men and women being terminated in a variety ways? Of course. Casting is inordinately fine. In it you’ll see Don Johnson’s “just arrived 50 shades” daughter Dakota as well as Julianne Nicholson, who played opposite Benedict Cumberbatch in August: Osage County. With as good a Boston accent as any, Cumberbatch plays Whitey’s big time Massachusetts politician bro, Senator Billy Bulger. Kevin Bacon is a struggling FBI boss man. Later, Corey Stoll replaces Bacon’s character at the Federal Building. Peter Sarsgaard stands out well but too briefly as a flaky, coke-snorting hit man who has displeased Whitey — if you know what I mean. There’s a larger part for Joel Edgerton doing a Bostonian Fed who seems confused about the meaning of his job description. Maybe it’s because he grew up in Southie … with Whitey. More blurred boundaries. Once a longtime resident of Tulsa, Oklahoma, I must focus a moment on a hit that occurred there; one that Whitey called. The victim was a man named Roger Wheeler, a former head of Telex Corporation. The scene for the killing was at a Southern Hills Country Club parking lot as Wheeler was leaving after a round of golf. I remembered it while watching the film. Wheeler was connected to World Jai Alai. Bugler and three of Whitey’s associates were skimming from that recreational gambling business. Wheeler was making it difficult for the skimming to continue. Bang! 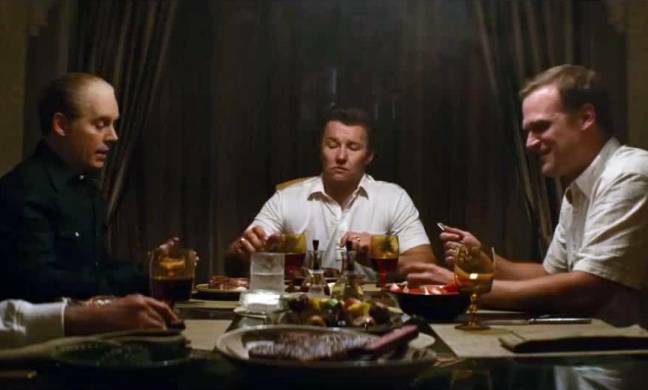 If you’re a Godfather freak or love to sing along with The Sopranos and can never get enough of seeing Good Fellas again, Black Mass is for you. You’ll spend more time in a Catholic sanctuary too, like you’ve done with all the great parade of mob movie characters who’ve tromped by on their way to the joint … and even the chair. Santa Monica was where Whitey’s big career was terminated.